This recipe is our first Readers Choice! Some lovely ladies named Ariana, Sam, and Christina wanted this recipe and they got it! I hope they enjoy it as much as I do! Thank you ladies for your love and support! 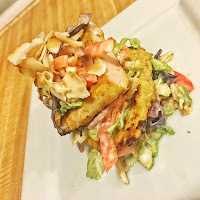 This recipe makes me think of warm nights and cold beer, the spicy chicken pairs perfectly with the crisp cool slaw and the toasted coconut is a fun addition, but not necessary. While spice heavy you can tweak this to be as spicy or not spicy as you want. Don’t be afraid to play with the marinade and taste as you go, you might like it with more garlic, or like me super spicy! Add the spices little by little and see what works for you. I use Badia brand spices unless otherwise specified (black pepper and salt always come from a McCormick spice grinder because it allows me to change how coarse or fine the grind is, they are 2.50 when they aren’t on sale and absolutely worth it) you can find these at most grocery stores and definitely at Walmart, where they have a HUGE selection of them, for about 1.50 each! In a large bowl add the coconut milk, pressed garlic and lime juice and mix. Add your spices gradually to suit your taste, if you are following the recipe above add everything to the bowl and mix. Butterfly chicken breasts and pound them evenly, this is important as it will not cook evenly and you can end up with dry chicken (no one wants dry chicken!). Add the chicken to the mixing bowl and let marinade up to six hours covered in the refrigerator. You can grill this chicken on your barbecue, or if you don’t have one, like me, use a grill pan, or a non-stick skillet, or even a Foreman Grill (this is my least favorite but it works!). Cook until 165 degrees, knowing visually or by touch when chicken is done will come in time, but even for me I like to check because hey, who REALLY wants salmonella? Nobody? Yeah, I didn’t think so. You can get one on Amazon.com, at Walmart, Chef Central or even Shoprite! Layer the cooked chicken with the creamy slaw, or again you can make this into a wrap or top a salad with the same ingredients! There is no reason you have to cook every night, but there also isn't a reason you have to eat the exact same meal every night. Play with the spice level, add or subtract for your own flavor profile and get ready for those hot summer nights!